Chocolate peanut butter granola sounds more like a dessert than a breakfast. But it’s actually the perfect breakfast combination that’s both nourishing and delicious. I love to serve mine with milk, natural yoghurt and some banana and sit down and enjoy every last mouthful. Then you also get the ‘chocolate milk’ left in your bowl at the end! 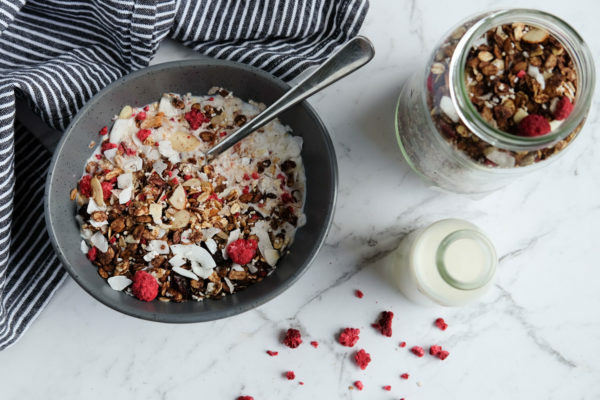 You can really mix and match the base ingredients to suit your taste when you’re making muesli. If you don’t have the exact ingredients, changing things like the nuts or seeds used generally doesn’t make a big difference if you use similar sized ingredients. You can replace the puffed amaranth for more oats if you wish. I used it because it adds a different type of grain into the mix (and I had lots in the pantry!). Variety is a good thing when it comes to nutrition. Since different foods contain a different combination of nutrients, having variety helps ensure you get a range of nutrients in your diet. The grain amaranth contains copper, manganese, magnesium and phosphate. It’s also is a source of iron and calcium, and is a gluten-free grain. Because I’ve used puffed amaranth it also adds a lighter texture to the chewy oat mix. You could also swap this out for puffed quinoa if you prefer. The freeze dried raspberries make this chocolate peanut butter granola extra delicious and add a wee bit of luxury to breakfast. It would make a lovely home made Christmas gift too. Just place in a large glass jar and tie a pretty ribbon around the top. In a small microwavable bowl, mix together the honey, cocoa, oil and peanut butter. Place in the microwave for 30 seconds, stir, then microwave again for 1 minute until the mixture is melted together. On a large oven tray, place the oats and sunflower seeds. Place in the oven for approximately 15 minutes, stirring half way through cooking. Add the nuts and cook for a further 5 minutes. Leave the mixture on the bench to cool. To speed this up, tip the mixture onto a cold oven tray. When cool, mix through the remaining ingredients and store in an air tight container. If you’re after more granola / muesli ideas, this apricot and cashew muesli is also delicious and our home made muesli bar recipe is a winner for snacks and the lunch box. Hi Nicola, where do you buy your puffed amaranth from? This sounds soooo good! Do you get the freeze dried raspberries from MW?